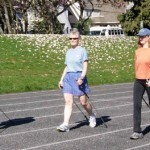 Walking poles are very important to seniors, especially when seniors are going to engage in various walking activities, such as hiking activities for seniors. Walking poles are very useful in providing more support and balance as seniors are going to walk. However, walking poles will never be that efficient and beneficial to its users when users do not know how to choose the right walking pole and properly measure walking pole’s length and size. Walking poles are not even used only to provide more support and balance, walking poles can even be used for exercise, since walking with walking poles can make use of the user’s upper body strength, thus utilizing more muscles and burning more calories. Walking poles are not only made by one material alone. The shaft is the long portion of the walking pole and the materials used in making the shaft varies. There are several different materials used in making walking poles, each material differs in quality and price. Some walking poles are expensive due to the material used in making the walking pole. Materials used in making the shaft of walking poles include and not limited to aluminum, titanium, and carbon fiber. 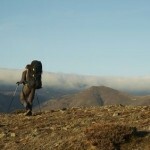 Carbon fiber trekking poles are usually very expensive. Carbon fiber is very durable and very light in weight. In fact, a pair of walking pole made of carbon fiber only weighs from 13 ounces to 18 ounces. Some people who want to use very lightweight walking poles and have the extra income to invest in buying expensive walking poles, then walking poles made of carbon fiber will be perfect. 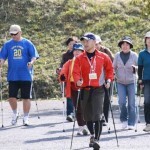 Walking pole shafts made of aluminum is the most bought and used walking poles by a lot of people. 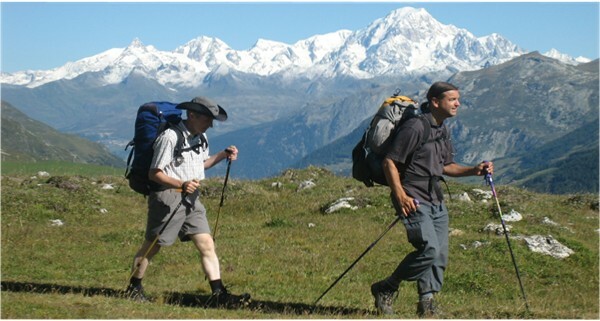 Walking poles made of aluminum may not be as light as walking poles made of carbon fiber, but walking poles made of aluminum are very durable, may even be more durable than carbon fiber and it does not come in a very expensive price. A pair of aluminum walking poles usually weighs from 18 ounces to 22 ounces, unlike walking poles made of carbon fiber, which only weighs 13 ounces to 18 ounces. Just like aluminum, walking poles made of titanium are also more durable than carbon fiber. 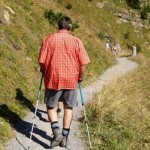 The downside of titanium made walking poles is that it is heavier than aluminum made walking poles. Titanium walking poles are not also as expensive as carbon fiber.